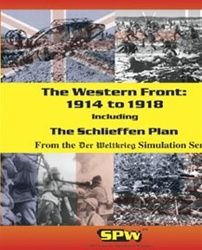 Six Separate Scenarios PLUS Campaign Game PLUS Links to Other Games of the Series. War has come. Germany is faced with mortal enemies on two fronts. She must eliminate one threat, or face being crushed between the two. The German strategist von Schlieffen plans one of the great military gambles of all time. His scheme is to concentrate to knock France out of the war before Russia can fully mobilize. 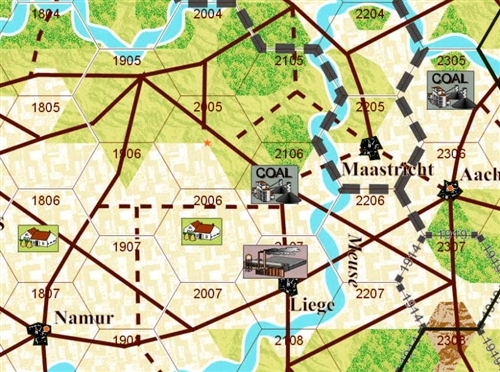 The bulk of German forces will move through neutral Belgium. Graf von Schlieffen intends to fall on the flank of the French armies. He believes the French will over commit to regaining their lost provinces of Alsace and Lorraine. The Schlieffen plan runs into complications from the moment it is launched. The Belgians fight back. The British join the fray. The French display surprising flexibility. Can the invading German armies still defeat France? Or will the French, British, and Belgians stop them? This time, it is up to you. The immediate threat to France is over. The Germans have re-deployed substantial forces to the Eastern Front. French and British reinforcements arrive in increasingly telling numbers. The French believe the opportunity has come to expel the invaders. Both sides have used the lull since 1914 to dig in. Trench lines stretch from Switzerland to the English Channel. The Germans may be weaker, but they stand inside the most extensive field fortifications the world has yet seen. The Germans reduced the Russian threat in 1915. Now the German Field Marshal von Falkenhayn believes he can eliminate France through a battle of attrition. An epic struggle that will sear the bodies and souls of both nations begins. Both sides will feel the effects of losses on a national scale. Yet neither will shrink from the cost of the sacrifice. The new British Army is ready. With German attention focused on Verdun, the British feel they have a chance to break through. An intense, week long bombardment will pulverize the German lines before the attack begins. The British climb over the top and begin to cross no-man's land. The Germans survived the shelling and doggedly defend their line. Bitter fighting will last for months in the valley of the Somme. The French are now led by General Nivelle, a hero of Verdun. He plans a two pronged attack against the German salient pointing at Paris. He intends for his "Army of the Rupture" to be through German lines in a day. The problem is the Germans also see the potential of his plan. They retreat to the formidable defenses of the Hindenburg Line. Nivelle plows ahead regardless. The soldiers of the French army are rather unhappy with the result. The Russians are out of the war. The Germans now concentrate in France with divisions trained in new assault tactics. The Stosstrupen are aimed at the weak point of depleted British lines. The Germans will have to win before tanks and American troops will tip the scales against them. Can the British and French hold out until a counter-offensive is possible? Or will the war drag on into yet another year?